In Russia, still a lot of people are using smartphones BlackBerry without connecting services BlackBerry the BIS . Since the standard for Twitter BlackBerry works either via WiFi (but it is not available on all smartphones) or through the BIS, there is a need in the client program of Twitter, which does not require BlackBerry Internet Services. 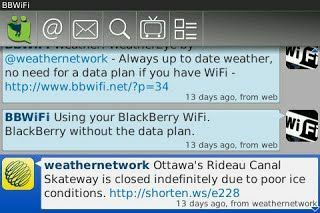 We suggest you pay attention to ÜberSocial program BlackBerry. It is free if you do not mind to see some advertisements, and $ 5 per year, if against. Download the program from the very BlackBerry: http://bb.ubersocial.com/bb/download.php, and with the computer http://bb.ubersocial.com/bb/ with the subsequent installation of a smartphone. The developer has provided the ability to install on all devices with OS 4.2. UberSocial works like WiFi, GPRS and through BIS and does not require connection. However, there are other types of compounds in its settings. Download the archive with the program on your computer http://bb.ubersocial.com/bb/ link and unzip it. 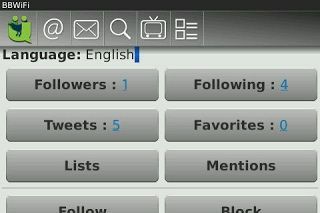 Open the BlackBerry Desktop Manager and download the version of the application in accordance with your OS BlackBerry. Set permissions for the program in the "Allow" in the settings of your BlackBerry (optional). You must be correctly configured on the Internet BlackBerry. When you start the program, specify your username and password on Twitter, if necessary, enter the GPRS connection type, and whether to use WiFi. If you have any difficulties, please contact us. Our experts can also install many other programs .